The Cave of Ice Stalagmites is so mysterious that we believe you will never forget once you see them. Let's go to the mysterious world! Enjoy a stroll through the forest in snowshoes! 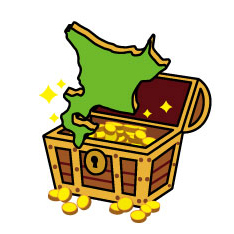 Your goal is the unexplored regions of Ōtaki! 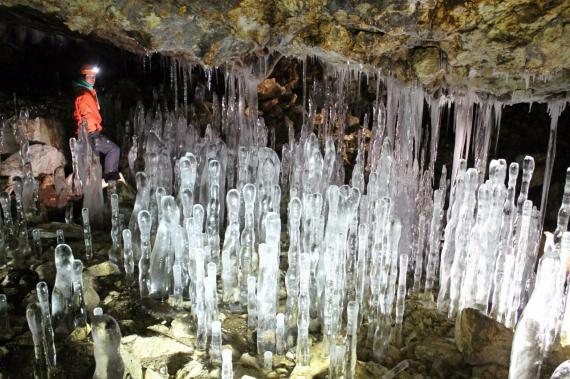 Discover the Cave of Ice Stalagmites (ice pillars and icicles)! The local people call them "Nyoro-Nyoro". It's the only-winter activity that you can experience here in Ōtaki, Date, Hokkaido, Japan! Walk through the vast snow field backed by beautiful mountains. Step into the winter forest and listen to the music of a stream and songs of birds. Then suddenly, there appears a fantastic and mystic cave right in front of your sight. The Cave of Ice Stalagmites! This tour is the only official tour organized by the local guide! 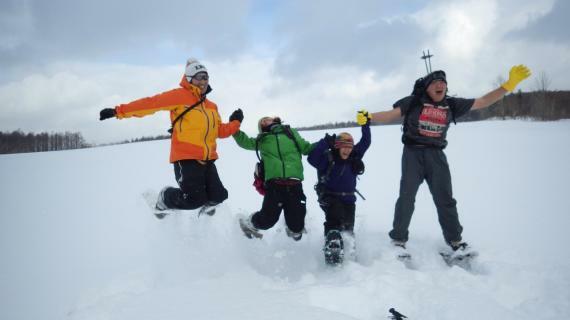 Enjoy the beautiful snow field of winter of Hokkaido, wearing snowshoes! The Cave of Ice Stalagmites is Must-See in Hokkaido!! And, enjoy tea time in handmade lovely "Hattifatteners" cookies and hot tea. 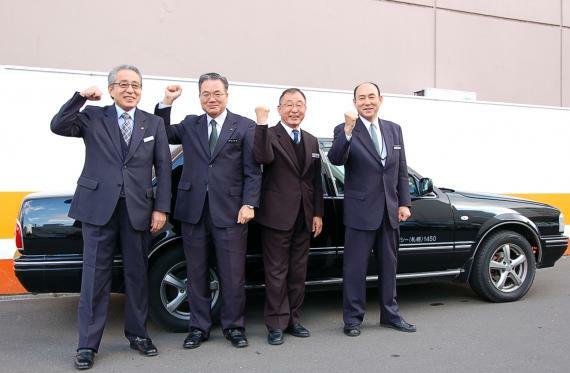 Taxi plan is safe and trustworthy in a winter road in Hokkaido! Because it's difficult to go to Date City by public transportation. * Dates may vary depending on the snow conditions. 4:30pm　Depart "OOA Ootaki Outdoor Adventures"
* New Chitose Airport pick-up and drop-off service available. * Please be aware that this program requires 9 hours to participate. If you would like to extend the time, you will be charged an additional fee. * Schedule might be changed due to traffic, weather or other conditions. Ages 9 years old and up. Pregnant women and the person of the chronic disease may not participate. Minimum 2, maximum of 4 in one vehicle. You will be divided into separate vehicles if your group numbers 5 or more. - Please bring warm clothes (ski wear etc). - Please make sure to wear an extra layer of fleece clothes. Sunglasses or Goggles, Long winter boots. * Rental snow wear and snow boots etc. are available (at additional cost). Please tell us at the time of booking, with your size and shoe size. * Rental snow wear and snow boots etc. are available. Your driver will wait for you in the ground floor of your hotel. * Please note that the driver is not an English-speaking tour guide. We do, however, provide an information sheet in English. around Odori Park and Susukino), or near JR Sapporo station. depending on the address, an extra fee may be applied. - Advance Payment by online credit card. - Advance Payment by overseas bank transfer. * Note: Payment is due 3 days before the tour date. - The driver is not an English-speaking tour guide. - The guide/instructor will explain in easy/simple English. - The program might be cancelled or changed due to weather conditions etc. - Please follow the guide's instruction at all times. - Please understand that this is an outdoor sport. 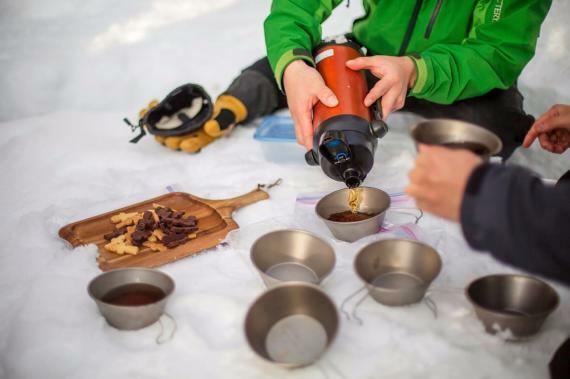 - Depending on the snow conditions, you might not be using snowshoes. - We will provide handmade snacks on the tour at tea-time. Please let us know in advance if you have any food allergies (wheat, egg, walnuts, etc.). * The deadline for submission of request is 3 days before the desired date to allow for processing time. Therefore please send request early. The Cave of Ice Stalagmites is Must-See in Hokkaido!! The local people call them "Nyoro-Nyoro" = "Hattifatteners".